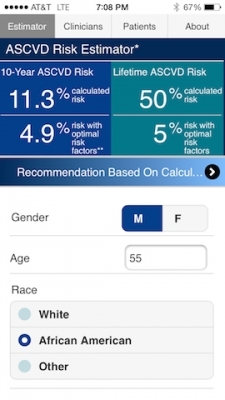 The app opens to a screen where you enter the patient’s data which includes gender, age, race, HDL, total cholesterol, systolic BP, diabetes status, smoker status, and whether they are being treated for hypertension. Once all of the data is entered into the intuitive interface, the 10-year and lifetime risk is automatically displayed. 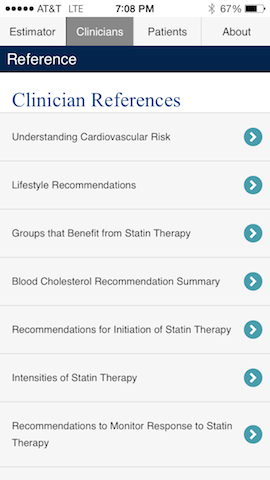 From there, you can click to see recommendations regarding lifestyle and treatment (including level of statin therapy). 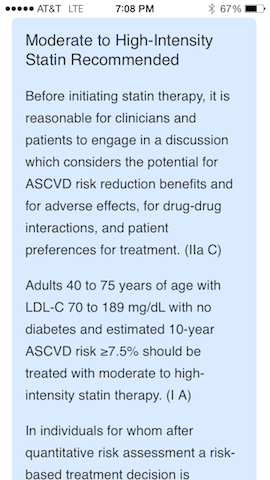 There are two other tabs that provide information relevant to ASCVD including risk and treatment. One tab is for clinicians and the other is for patients. The information is laid out well and sources are provided. Ability to get statin therapy recommendations is the most tremendous feature of this app. The ASCVD Risk Estimator app is good for getting a quick estimate of a patient’s risk. 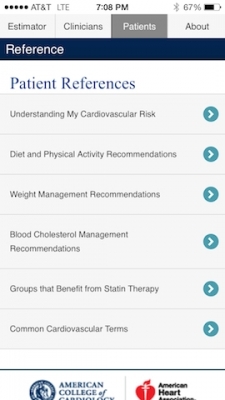 The app is useful for both patients and physicians. Physicians can use it to estimate risk–an important factor in guiding treatment. 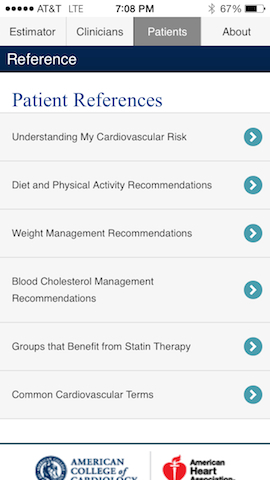 The app is also a good source to learn about ASCVD and related lifestyle and treatment information. Devices–This app was reviewed using an iPhone 5s. User Interface: 5/5 – There is effectively no learning curve to using this app. It is simple and intuitive. Multimedia Usage: 5/5 – For the goals of this app, the multimedia usage is quite good. Although there aren’t any fun gadgets such as videos, this is an example where less is more. Real World Applicability: 5/5 – Although the scope of this app is relatively narrow, this app does exactly what it claims to in a quick and easy way. 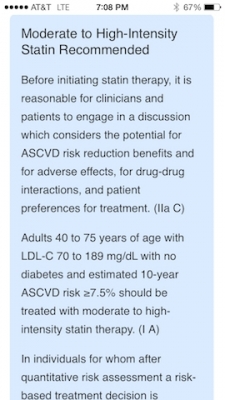 For the purpose of estimating ASCVD risk, it is certainly usable in the real world.